Anyway, yesterday, we installed Indian channels. Its been a year we have been here and we hadn’t subscribed to them earlier because I was never a fan of Hindi serials- they all start off well and then drag on, and I could never follow or understand them. So, we thought it might be pointless paying so much for these channels. But, for the last one month we had been contemplating giving these channels a chance. So yesterday when the guy installed the dish and I switched on the TV to a bollywood number on our TV, I was nostalgic like crazy. And there I was. On my sofa. A tear in my eye. Nope these weren’t tears of happiness. But me, missing my home, my country, my people, missing the senseless lyrics of Bollywood songs, the colorful dresses, the bargaining for a Rs.10 (20 ¢) hairband, the food, the crowded streets, the blaring music, the non stop horns for no reason- I started missing it all. There are a lot of things wrong with my country. I am aware. But, like every mother who knows his kid isn’t the perfect one and still loves him/her nonetheless, I love India. The country is imperfectly perfect for me. And like every mother who is away from her child, I too ache to be back in my own country. No matter how comfortable life is here in the US and the independence I have in running my house the way I like, I miss the crazy life of India. I really do. I have never been a person happy away from India. I experienced the same feeling when I stayed in Moscow for two years. I did enjoy myself there too but there was a part of me that craved India, and that craving in me is alive, now and always. 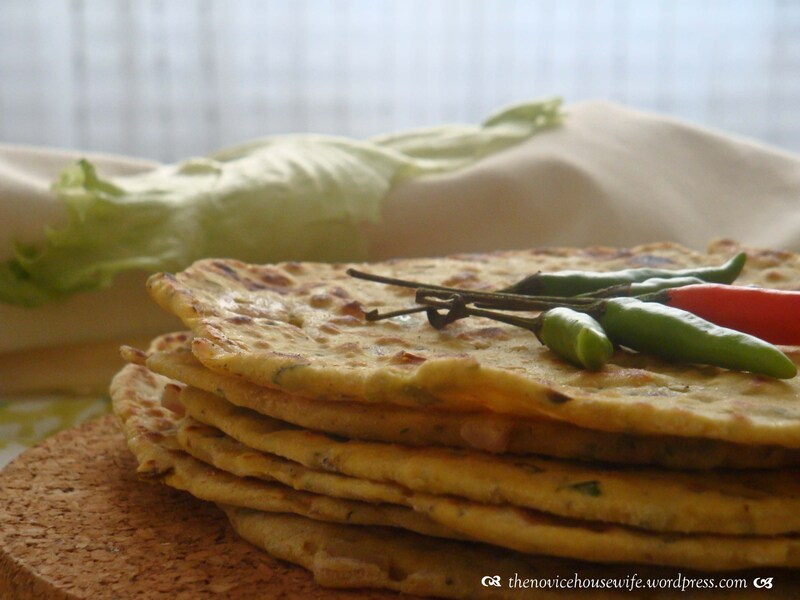 The one thing that all of us loved at Sher-e-Punjab were the missi rotis (an indian flatbread), served with butter. Even though some people had stuck to their usual order of rotis and naans, the 2-3 of us (like me) who did order missi roti, convinced the others to try them. And, they were glad that they did! 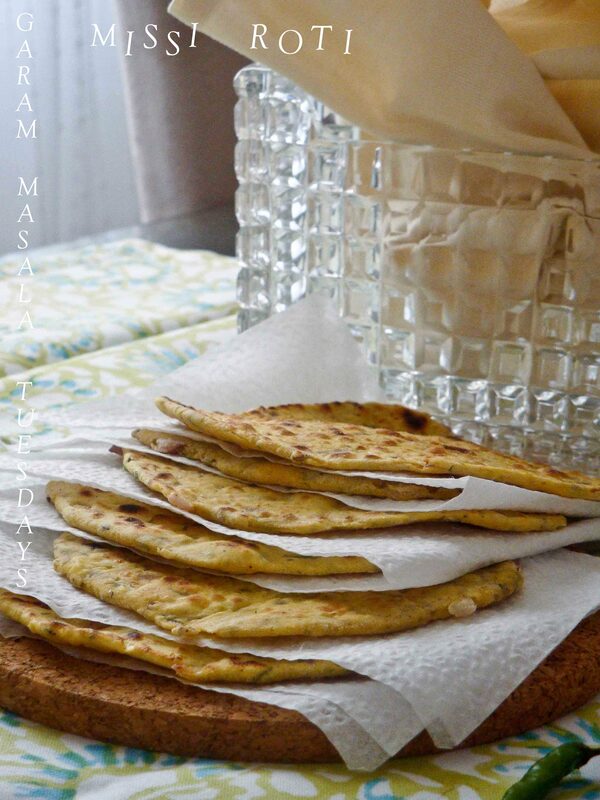 Missi roti, pronounced “Miss-ee Row-tee” is a staple in Punjabi homes and is basically roti prepared from besan or gram flour/chickpea flour. Served with a dollop of butter and accompanied with any Indian vegetable or lentil dish, missi rotis are an excellent way of sprucing up the proteins in your diet. Missi Roti can be served for breakfast with curd or pickle. Missi Roti is good for diabetics too because of gram flour added to it as an ingredient. Gram flour is said to keep insulin levels in check! Missi roti makes you very thirsty, so be prepared to drink a lot of water after eating it! Traditionally Missi Roti made in the tandoor but at home I make it on the tawa (cast iron skillet). My mom adds pomegranatae seeds and is supposed to be key to the missi roti flavor. I did not have it, but if you do, for sure add pomegranate seeds (anar dana). You can also change the ratio of besan (gram flour) to whole wheat flour but accordingly change the amount of water you will require for kneading. 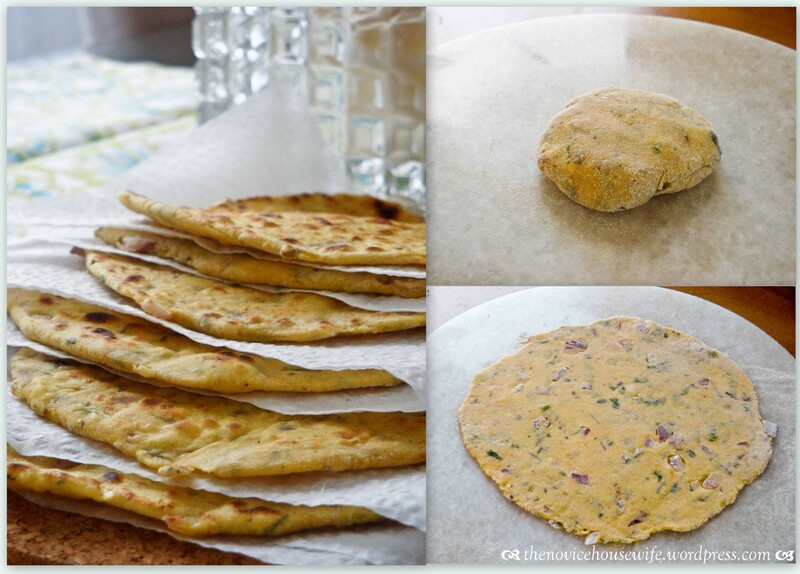 Naan takes the cake among foreigners but try this unleavened Indian flat bread made on a hot iron plate (tawa) from whole grain wheat and legume (chickpea) and you might change your likes. Plus, for the health nuts, its more nutritious than traditional Naan as gram flour is high in protein and iron. In a pan, dry roast cumin, ajjwain, coriander seeds. Be careful as to not burn the seeds. Once roasted, in a mortar and pestle, coarsely grind the seeds. You do not want to make a powder, you just want to crush the seeds a little. In a large bowl, add all the ingredients except the butter and water. Mix all the ingredients together. Then, make a whole in the middle and gradually add water, bringing in the flour to mix with the water, slowly. You might not end up using all the water, or you just might end up using all the water. the dough should not be sticky when you are done with it. You should be able to roll it without it sticking to the rolling pin. Once kneaded into a smooth dough, let it rest for 10 minutes under a covered cloth. Once rested, knead the dough again for a minute. Divide the dough into 12 portions. Make rounded balls with each portion. Heat a griddle, hot iron plate/flat cast iron skillet/tawa on medium-high heat. Take one dough ball at a time. Flatten it slightly and roll both sides in some whole wheat flour. Put the rolled out dough circle on the hot skillet. Cook for about a minute on one side. Flip it over. Slather some butter/ghee on the top side. After about a minute flip it over and slather butter/ghee on the other side. Cook both sides till you see a rustic brown color on each side. Serve it with some pickles and curd or with any Indian main dish. To try another Indian bread, check out this post on pooris. Baby I love ur Blog………. 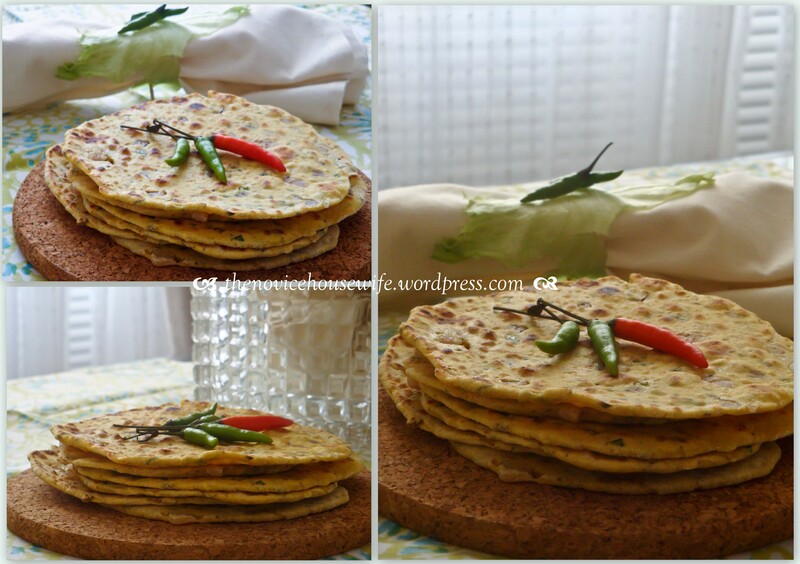 Lovely missi rotis and lovely blog! Also, you won 500 cupcakes cookbook on my website, Cupcake Muffin! 🙂 Please send me your mailing address so that I can send it out to you! My email is schatfield -at- berkeley -dot- edu. Hi,love your blog…missi rotis are truely delicious…..i like it w/tomato chutney..
Hi shumaila, first time in your blog!, lovely blog you have, I shouldn’t say first time, I came to your blog looking for some Recipe to try out, I liked your Garam Masala Tuesdays and that you are a punjabi so I started looking for something authentic, and I made these Missi Roti’s I had made these a few times but missed the authenticity in it :), Check out my blog as you were my choosen blog for SRC! !, will post the other one which I tried from your blog soon, well that’s a secret.., will be visiting you often to check out your tuesdays! !, I am not a good photographer as you are mine are just from my mobile!, Great clicks you have in your blog!, In btwn I too made those tokri baskets seeing the same video what a coincidence!, only made different chat!, thanks a lot for this lovely recipe. Hey Jayasri! Thanks for trying out this recipe and glad you liked it! 🙂 Now, I am curious as to what else you tried from my blog! Waiting to hear from you! And I guess great minds think alike- great coincidence on the tokri baskets! Tried this roti and really LOVED it. Thanks for sharing this wonderful recipe. Hello! I have just recently been introduced to Indian food, and I love it! I have been trying to find things I can make at home for my family, and came across your lovely blog. I love naan, but am on a low-carb diet and can’t really have it. This recipe says you can change the ratio of chickpea flour to whole wheat flour–is it possible to make it completely with chickpea flour? If so, what if any other changes should I make? Thanks in advance, and keep up the great work. I look forward to trying many of your recipes! Hi! I am so sorry for replying late to your query. Since I have not personally tried it, I had to ask my mom about it and this is what she had to say. She said you can make it with just the chickpea flour, but the batter would be more like pancake batter. So instead of shaping out the “dough” with the rolling pin like you would do in the recipe I have given, you would have to pour it out with a ladle directly onto the pan/griddle. The end product should be thinner than you a pancake though, more like crepe thickness (but not as thin but closer to a crepe than a pancake). And, if you use egg (or even a egg white) instead of the water in the recipe (and no wheat flour) you get another Indian favorite called a chilla, which too makes a great healthy meal (it’s actually a chickpea omelet and you can use all the other ingredients in it-like onions, green chilies, coriander, etc)!